When you keep any type of animal species inside your home, it’s important to make sure they feel comfortable and safe as possible. That will ensure your pet lives a happy, healthy life. Unlike cats and dogs which are more adaptable to being inside, reptiles are native to the outdoors so it’s that much more critical to create a cage that is reflective of their natural environment. Whether you’re a new or existing parent to a reptile, here are some tips to get your (and your lizard, gecko or snake) reptile terrarium set up as best as possible. When you’re housing your reptiles outside, it’s especially important is to ensure a proper substrate that covers the bottom (i.e. the material they walk around and sleep on). In particular, you want the group to be a soft material so they can dig and keep their claws trimmed. While this will help the lizard’s hygiene, note that softer materials are often more difficult to clean. A good mixture of sand, mould, and bark chips should do the trick. Unless your reptile is a native sand species, we don’t recommend using pure sand or gravel as your lizard will often eat some of the substrate, and sand and gravel aren’t optimal for digestion as you can probably imagine. You should also avoid peat (dust) as you don’t want the ground particles to become airborne and cause breathing issues/ lung damage. The depth of your substrate covering should be at least 30 centimeters, but don’t go overboard. If you use too much substrate, your ground cover will retain excess moisture and cause an unbalance in the humidity level. Speaking of humidity, for tropical lizards species it’s a good idea to keep your ground covering damp. And, you’ll also want to provide your lizard with an ample supply of water. Not only for drinking, but, for aquatic species, for swimming as well. When planning for and putting together your terrarium supplies, it’s important that you give them plenty of opportunities to climb and hide to mimic the changing conditions of an outside environment. When picking stones and wood, use smooth stones, and try to use at least one large flat stone so they can lay out and bask on it in the sun. You’ll also want a shady area where they can go to cool off when needed. Bottom line, there should be a gradient of temperatures in the cage that allow them to warm up and cool down as needed (i.e. regulate their body temperature). With regard to climbing structures, give them ledges and overhangs similar to what they might find in a natural environment. This will help them move and get exercise, as well as feel more at home. Bottom line, make sure all your “furnishings” are solid and fixed in place – you don’t want your reptile knocking over a rock and getting squished under it. If the climate allows, all reptile species, especially the larger ones, should be housed in an outside cage. Fresh air, humidity, sunshine, and enough space to roam freely are all aspects of an ideal outside environment for your lizard. While reptiles can somewhat tolerate drier and colder climates, they are not optimal. If you live in an area that is too cold or dry, you should house your reptile indoors. If you’re in an area that is humid, but experiences cool periods throughout the year, we recommend investing in a heated shelter. If you live in an area that experiences heavy rainfall, you’ll want to make sure you cover your reptile cage with waterproof coating, and you can purchase waterproof lamps. And if you live in a cold area, build your cage with only one entrance and add insulation material to keep heat from escaping. You may also want to use an electric heater, like those used in greenhouses. If the area you’re planning to house your lizard is too hot (think Nevada, Utah, inland California, Australia, etc.) during the summer, you’ll need to provide shaded shelter where they can regulate their body temperatures. Just like any animal in captivity, it’s highly probably that your reptile may try to make a run for it at some point. So you should build a cage that is large enough for them to have plenty of roaming room. Use a hard, solid floor beneath your substrate (so they can’t burrow under and out of your cage), and use a smooth material for walls so they can’t climb out. Finally, avoid glass which is heavy, pricey, and can prove a danger to your reptile if shattered. 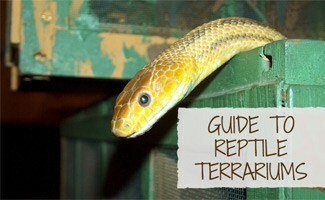 If you are looking for reptile terrariums for sale, you may want to consider our editor’s pick to the right. You can DIY and build your own cage in no time. But if you’re still unsure about what you’re doing, or the best way to proceed when building reptile cages, we recommend you simply hire a carpenter. In most cases they will have the necessary expertise to build your cage, as long as you guide them and inform them of your lizard’s needs. Watch this quick two-minute video where Nicole shows her lizard terrarium and some tips on how to keep her pet reptile happy. Want to learn more about lizards? Check out our article on 7 types of Geckos that make great pets. Do you have a reptile terrarium and if so what tips do you have? My son has been wanting a pet, and I’m thinking of getting him a lizard. They seem to be low maintenance and a lot of fun. I think it’s important that we can provide the right environment for the lizard. As you mentioned, climate and temperature are important to consider. We live a fairly dry but occasionally cool environment. We will have to talk to a professional to see what the best living conditions would be for our future pet. I’m glad you brought up putting places for them to hide because I would have never considered doing that. Reptiles naturally climb and hide and rest on high platforms so it makes sense to ensure you include it. Planning ahead and building the habitat before getting the pet will help you be prepared for their arrival. Amy, thanks for this article, very useful! As a summer project with my kids I am building them a cage for a new pet lizard Larry and don’t know where to start so glad I found these tips which came in very handy!